Exceptionally black nights and foggy or dusty conditions anytime are when you want to supply as much light on the terrain ahead as possible. If you could, you might go for a 50-inch LED light bar, but sometimes there is not enough horizontal space on the vehicle in the right location. In these cases, where you want to maximize the breadth and depth of your driving vision, a powerful 42″LED light bar might just be the ticket. Additionally, a 42-incher will make less of an impact on your vehicle’s electrical system and your wallet. This hefty 42″ light bar from Eyourlife has double the brightness and double the LEDs of their 24-inch model. 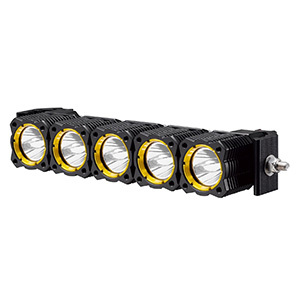 It features 80 high-output Epistar LEDs inside a corrosion-proof, IP68 aluminum housing with deep, vertical heat sink fins integrated with the back. It is a relatively light 13 pounds, draws under 20A and has a tough quartz lens. 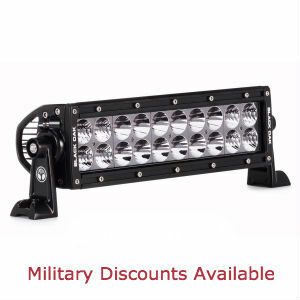 The LEDs are rated for 30,000 hours and the entire light bar is backed by a 2-year warranty. One of the unique uses for this super-bright 42″ light bar by one buyer is to illuminate nighttime pick-up baseball games. It really is that bright. Naturally, most buyers use this bar for other purposes, such as trail exploring, work site illumination or safe driving on the darkest, most serpentine back roads. 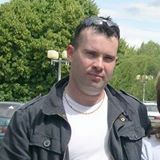 The main feature of the majority of 5-star reviews are exclamations about its brightness. There have been a few condensation issues, however, so re-sealing on arrival may be prudent. 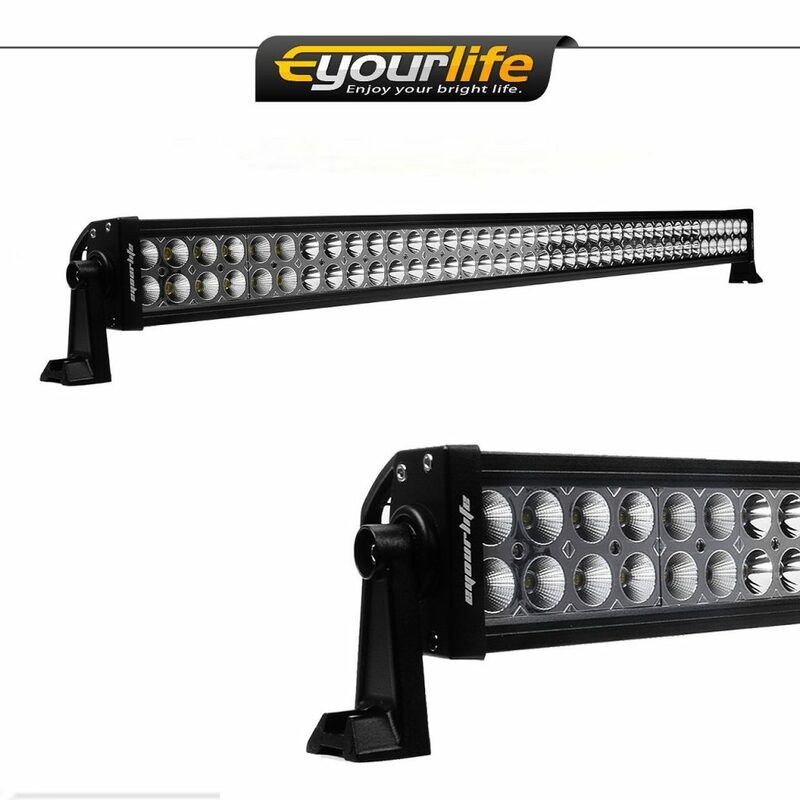 Eyourlife is well-known for making good quality light bars and their 42-inch LED bar is another shining example. It truly is an amazing buy at under $80. If you are concerned about the quality or longevity, buy backups. You will still be ahead compared to more expensive 42-inchers on the market. Mictuning’s model 3B339C 42″ light bar boasts a gentle, sweeping curve that provides more beam width and a touch of elegance. Eighty 3W CREE LEDs output nearly 20K raw lumens with only 20A. Milled-tip, integrated heat sink fins provide optimal LED cooling. The multi-section LED/driver design ensures other sections keep shining if another is damaged. The optically clear polycarbonate lens has an IP67 rating against moisture and dust. Also included is a lighted rocker switch, cable, relay, fuse and IP67 connector. Thanks to their use of CREE LEDs, this 42″ LED light bar from Mictuning is brighter than many 50-inch bars. Whereas other makers only offer combo beams in this length, Mictuning provides flood-only and spot-only optics options. One drawback is that it only comes with end brackets, which limits mounting options, but there is a complete wiring kit included. 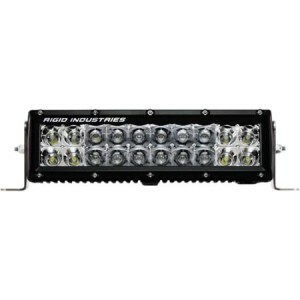 Mictuning is an underrated brand that delivers high-end features other light bars do not in this price range, such as redundant LED module design. This is a powerful and nice looking 42-inch LED bar that offers superb value for your lighting dollars. 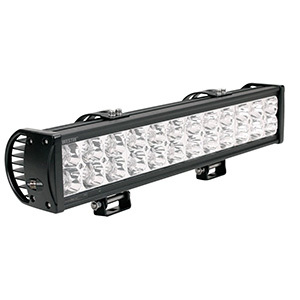 If you are looking for a stealth look but plenty of luminosity, this single-row 42″ light bar is what you are after. Its 5D optics combine both a reflector and lens for each LED not unlike a well-known, more expensive brand, so you get 97 percent of the light out front without dark spots. Forty 3W CREE LEDs provide 12,000 raw lumens of light. It comes with end brackets, hardware and a full wiring kit. This single-row 42-inch LED light bar from Auxbeam looks sleek while putting out a terrifically bright, broad and penetrating beam. The low-profile reduces wind whistle also. The 5D optics create a brighter beam plus a seamless mix of the flood and spot sections. Some buyers dislike the ultra-high 6500K light temperature as it washes out all color. It is a plus that Auxbeam includes a wiring harness. The Auxbeam single-row 42-incher is a clear winner for those vehicle owners who want a less obtrusive look or have minimal vertical mounting space. It features quality LEDs, advanced optics and low power consumption while still blasting out a clear, void-free beam. It is an excellent value in the under-$150 range. 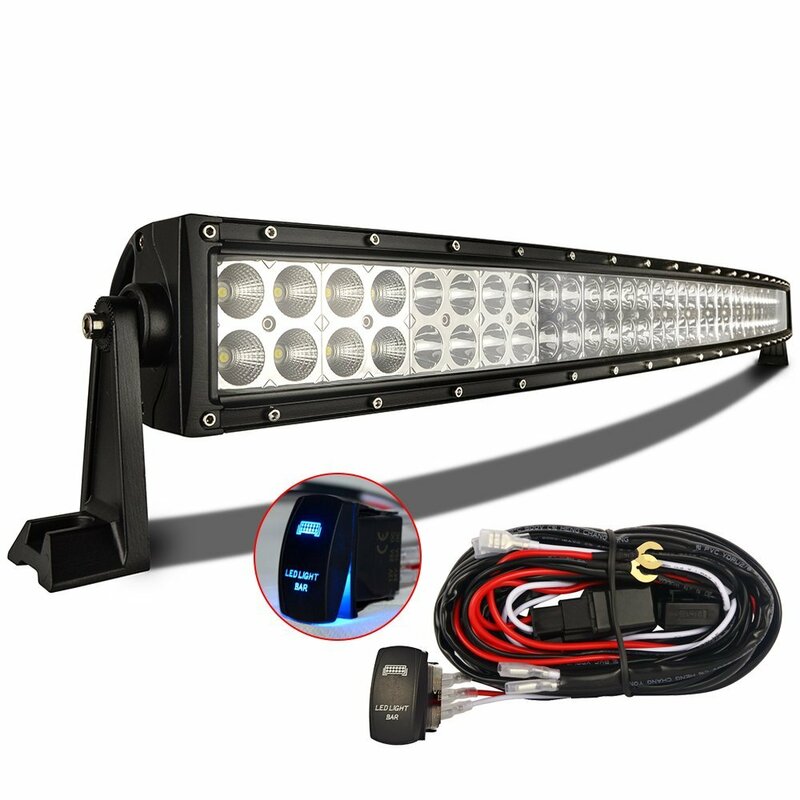 This Arsenal Offroad Curved LED light bar powerhouse features 216 3W Mega Watt Super LEDs in three rows to furnish dark-busting light for cars, trucks, 4x4s, boats and heavy equipment. Sealed bolts, military-grade breathers, a polycarbonate lens and sturdy aluminum alloy housing earn an exceptional IP68 waterproof/dustproof rating. Oversized heat sink fins maintain the LEDs’ 50,000-hour lifespans. An outward curve plus center spot flanked by flood beams produce panoramic light output of 64,800 raw lumens to bust open the darkest nights in any weather. Included is a pro-grade harness with switch, relay and 17 feet of wire. When a 50-inch light will not fit, this one provides nearly equal light output. The curve ensures void-free light across the field of vision. Specially designed 7D reflector/lens optics further enhance the penetrating output of this rugged light. 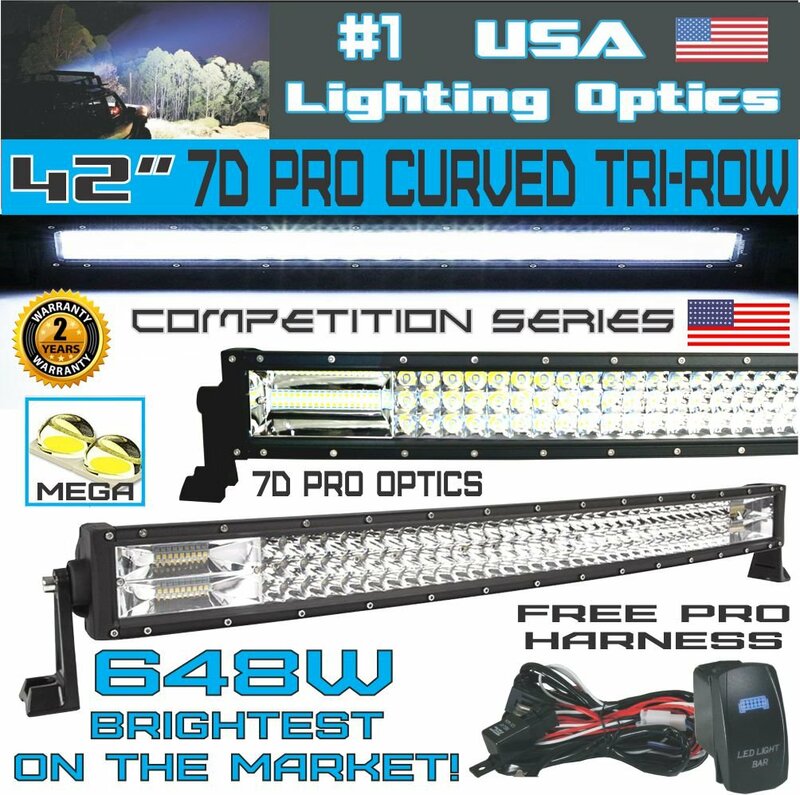 This curved, rugged, IP68-rated light bar has astounding light output and comes with a complete wiring harness including a 40A relay and lighted switch. 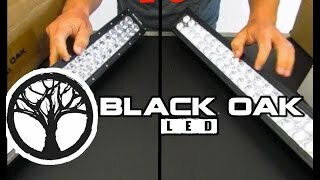 At under $160, it is a popular “mega light” choice. 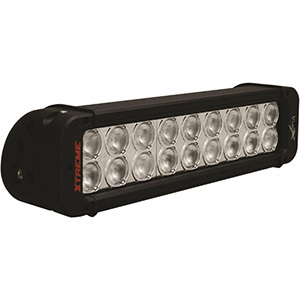 A 42-inch light bar makes a powerful statement about the importance to you of a well-lit trail, road or work site. It is often a perfect fit for narrower cars, 4x4s or vehicles such as UTVs, ATVs and tractors. These are no slouches either in terms of their broad and deep beams that can light up a soccer field. If you have the power budget and a tight fit, look to a 42-inch bar to fill the bill.